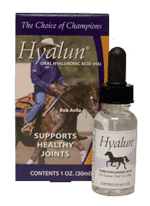 Hyalun® is a tasteless liquid solution that your horse won't even detect or resist. Simply administer one full dropper (1ML) of Hyalun® once daily. Provides a 30-day supply of this revolutionary product. For the larger stables, Hyalun® 90 is an economical system that is easy to administer with its built in equine extension dispensing tip. The equine dispensing tip allows for fast and easy administration. Just pull the trigger and a calibrated amount is dispensed. No need for measuring. A pleasant smelling cream which uses patented ingredients to help soothe, moisturize and maintain healthy equine joints and muscles. Contains hyaluronic acid (HA) and cetyl myristoleate (CMO) for their ability to lubricate joints and emu oil to penetrate deep into the skin tissue. Hyalun® Gel is a 30cc syringe designed specifically as a pre/post event booster and also as a preload to the daily oral solution. Hyalun® Gel is six times more powerful than the daily Hyalun®.